Below is the feedback from the students who attended SIGGRAPH 2009 in New Orleans through the Spend a Week at SIGGRAPH program. The ACM SIGGRAPH Computer Graphics Pioneers and the National Science Foundation (NSF) sponsored the students. SIGGRAPH was very fun and exciting. This was the very first time I have gone to a convention for computer graphics and I am happy to say that it exceeded my expectations by far. I loved the exhibitions, galleries, and the sandbox along with all the special speakers and talks. The exhibitions were wonderful. First off there was free stuff and who doesn’t love free stuff, but it also taught me a lot about some of the companies and what they have to offer. In addition, the exhibitions for colleges were good to help me see what colleges are good for computer graphics and which ones I like. I also found out that Pixar gives the best free stuff and that they’re an awesome company. The gallery I liked the most was probably the emerging technologies. It was great to see brand new technologies that were cool and amazing, yet at the same time simple. For example, one emerging technology was an easy to make recorder that played, stopped, and turned the volume of music up and down just from the different sounds of different patterns of scratching on the table. If you scratched a circle on the table it would recognize the sound and you would be able to assign that sound to play or stop music, so whenever you scratched a circle on the table the music would either stop or play music. There were many more emerging technologies that I fancied, but I’m afraid it would take too long to talk about all of them. Overall I was very impressed with the emerging technologies and wish there were more. The sandbox was superb. It was a great way for me to actually test out new programs that I had never experienced or even heard of before. One program that I thought was very fun was Z-brush, which I had never heard of before. In addition, I found an animation program that made the whole taking shot after shot a lot easier. Not only that but I found out that you can download that very program of the internet for free. In between playing in the sandbox and looking at the galleries I went to speeches. Most of the speakers I went to I liked. I was surprised at the amount of speakers there were and sometimes wanted to go to different speeches that were at the same time. I went to all the keynote speakers and I truly believed that they were great picks. I liked Will Wright the most on playing with perception. It was a very fun and enlightening speech that I thought was well thought out. I had a wonderful time at SIGGRAPH, and am glad that I decided to go. With all the new technologies, speeches, and plain technologies that I had never heard of, SIGGRAPH blew my mind a way. Overall SIGGRAPH was a great experience and would love to someday maybe go again. It was the most exciting experience I’ve attended in my life! Siggraph opened my eyes not only as a technology conference but the culture of the entertainment industry itself. From the observing the developmental processes of robots manipulating organisms to learning about the long process of computer graphics in blockbuster movies from keynote speakers. It was amazing! One of my favorite parts of Siggraph had to be the exhibition floor; showcasing all the latest company technologies, gear, and especially the college booths for the pursuit of studying arts. The entire conference was mind blowing in ways I’ve never thought were possible. The community of professionals, teachers, and mentors felt energetic, either as an animator, special affects artist, editor, or just a businessman in the entertainment industry. The mentors were also very helpful with feedback on their own experiences. My mentor was a kind person who not just told me a lot about her own career but her view of the industry. She was a Visual Affects designer; one of the projects she worked on was the special affects for Fantasia. We actually sat down for lunch and talked for little more than an hour plus the walk through the conference. I appreciated that interaction with a professional, and it wasn’t intimidating. It was just one on one conversation with student and professional. Intel had its’ own section where anyone could come and sit down to learn about the different the software’s used in the industry. The most helpful booth of the exhibition floor was the college booths. It was unexpected and very helpful with me choosing college this year. I talked with teachers, watched demos, and received a lot of information about colleges like Ringling College of Art and Design and Savannah College of Art and Design. I went into Siggraph with a dream of either becoming a computer animator or videogame artist. Now, I want to truly continue my dream with the opportunity Siggraph has given me. Thank You! I hope one day I can be one of your keynote speakers in the future. 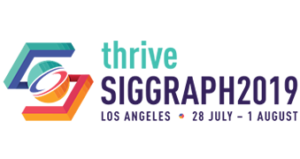 Having never attended anything like Siggraph, I at first felt questionable about whether I would enjoy it. Being only a freshman in high school, I had little knowledge of computer world I was about to step into, and truthfully, I feared that all of Siggraph would be a little over my head. But after my first day at the convention, my opinion changed entirely. Walking through hallways of technology, I was very surprised to find how willing people were to help me understand the methods in which everything worked. They really made the effort to explain the extremely advanced technologies in a way that made sense to me. I saw virtual reality systems, interactive and 3D holograms, fabrics with animated ink, revolutionary video games, and countless other gadgets of the future. The best part about this, however, was that not only did I learn about and see this technology, but I was also able to have a hands-on experience with it. I myself wandered through those realms of virtual reality and tried out nearly every new gadget there. I was beyond impressed by the things presented, especially considering that many of them were developed by independent teams of just a few members. I had one particularly good experience with a group who had created a touch-based system of controls for every electronic appliance in a living-room-style set up. This included a television, assorted light fixtures, digital picture frames, speakers, and to top it off, a little motorized vacuum cleaner. The touch controls for this room were all within a coffee table in front of a comfortable couch. The table was a touch screen monitor of sorts that displayed an overhead view of the living room from a small camera on the ceiling. To control each device in the room, I was told simply to touch. I could turn on the TV by tapping it on the table-screen, dim the lights by sliding my finger along them, open a folder of videos and play one on the TV in front of me by dragging one to the TV, do the same with pictures in the picture frames, all on this remarkable coffee table. And if some trash lay somewhere in the living room set up, I could touch the image of the vacuum cleaner, drag a path to the site of the trash, and away it would go. I listened to several speakers introduce their projects and show what they brought to the table. I found Electronic Arts’ presentation on their new boxing videogame Fight Night Round 4 very interesting, as it featured a revolutionary new physics engine that truly made the in-game action seem real. However the speakers as a whole were excellent, their talks were all engaging, and to my pleasant surprise, they were highly comprehendible. The diversity of technology demonstrated at Siggraph made it an incredible event to be a part of. With big name exhibition booths from companies such as Google, Intel, and Autodesk, motion capture studios and 3D printers open to use by visitors, and digital artwork created by talented individuals, unbelievable levels of ingenuity filled every hall of the convention center. To think about the mind blowing ways that the developing technology I witnessed is revolutionizing the entertainment world and affecting so many lives amazes me. I am so glad to have been a part of the 2009 Siggraph experience, for it will certainly not be one I will forget. When NOCCA offered me the chance to attend the 2009 SIGGRAPH conference in New Orleans, I jumped on the opportunity. I have always wanted to be a professional animator and work with computer graphics and that is what the SIGGRAPH conference is all about. On my first day at the New Orleans Convention Center, I was in awe. I was shown around by a mentor that said that she had previously worked on many animated films, such as The Hunchback of Notré Dame where she animated the special effects. She took me to see the emerging technologies and open studio. Most of the emerging technologies shown at the conference were pretty amazing such as the hologram that you could touch, the vibration feedback umbrella, the table that you could program to control the whole room at the touch of your fingertips, the holographic teleconference which projected your face in 3-d and the virtual reality room. However there were some new technologies that I couldn’t help but think to myself, “What in the world could you use it for other than maybe computer games?” For example, there was one exhibit that was a helmet that pulled on your ears to make you go right or left. The open studio was also pretty neat. I got to try out a Wacom tablet with Photoshop and Z-brush. I also used a 3-d printer to make my 3-d character into a small plastic figure. They also had a table set up for me to make stop motion animations, and they had a motion capture set up with people moving the characters in real time. The keynote speakers’ presentations that I got to listen to at the conference were very impressive. Will Wright, who is known for creating innovative games like SimCity and Spore, gave a talk about how we see the world and how the entertainment industry can work with that perception. Another talk I thoroughly enjoyed was a talk by Peter Sohn who is a professional animator at Pixar. He directed a short film called Partly Cloudy and spoke about the story behind the idea and some of the techniques used to make it. The only thing I didn’t like about the sit down talks was that the ones that I was interested in were so spread out in time. It seemed like there were a lot of technical talks between the creative ones. Being a right brained thinker, algorithms or crowd generation doesn’t really draw my attention. Some of the booths in the exhibition hall that I found interesting were from the motion capture companies, 3-d movie studios, 3-d screen companies and 3-d printing companies. At Alias’ booth they talked about the newest version of Maya and at Pixar’s booth had their fantastic program Renderman on sale which drew a crowd and very long line. If I were to go again, I would set up a personal schedule so that I could stretch the whole experience of the exhibition hall out over four days. My first encounter with a fellow Siggraph attendee was on the sidewalk of the convention center. It was a young man with a red vest drawing a beautiful welcome sign in chalk on the sidewalk. His energy as he worked was contagious and soon I could not wait to go inside. Little did I know what strange and wonderful things awaited me. I met up with my classmates and flew through check-in all the wile gawking at the floorshow behind the curtains. As excitement mounted we set off to explore the new and exhilarating universe called Siggraph. One of my fellow Siggraph attendees, Neil, and I set off to explore a room, I forget the name, where a man explained his revolutionary program that allows people to search through a database of pictured by drawing out their desired results; so instead of typing in “tree” the person can just draw a tree. This may not sound like an eye-opening experience but the applications that Neil and I thought of amazed us. So, starry-eyed, we walked out of the room and onto our next adventure. We followed some signs to “emerging technologies” in hopes to top the amazement we had just encountered. We stumbled into room after room with each room opening new doors into our minds and expanding our definition of the future. We played with holographs that we could feel; walked on wooden boards that felt like ice, saw semi-virtual games that respond to eye-movement, and even robots that fold clothes. One of my personal favorites as a large interactive floor that the creators explained to me is currently being used at a university for teaching purposes. This floor tracks movement with a wand held in the participant’s hand. With this technology they were able to explain physics, which I have never taken, to me in visual terms. They explained to me that they also work with special education children to help them recognize each other and form social relationships with one another. It was a very impressive and highly applicable technology. Overall the emerging technologies were all highly impressive and most likely my favorite part of Siggraph. But there was so much more to see, so we were off once again in search of something that could compare to the wondrous world we just encountered. That lead us to the generative fabrication rooms. If the emerging technologies are our future then the generative fabrications are our paralleled universe. One step into any of the rooms and you are in an alien world strange and unknown. There were giant plastic sculptures that responded our movement as we walked through the confusion of plastic fern-like arms and feelers of this tremendous plastic beat. There was a miniature world that responded to your interactions such as blowing to create a windstorm that erased the landscape and covering up the light source to transform the world into a nighttime wonder world. There were also buzzing glass tubes that derive their song from strands of human hair as well as breathing fabric, and I don’t mean cotton. Amazed and somewhat terrified, we walked out and continued our hunt for adventure. Neil and I, after a quick lunch to settle our nerves, decided to visit the computer animation screening which, I am pleased to say, was fantastic. The animation was topnotch and the story plots were highly entertaining. We sat though two sessions of the festival and enjoyed every minute of it. That concluded the first exciting day. The next day proved to be just as exciting as the floor opened up to us. A classmate and I met up again and we explored our new playground. Each booth proved to be amazing and insightful. We watched the motion suited people who were dancing to demonstrate the capabilities of their amazing suits and their digital counterparts who mimicked them. I had my face scanned into digital 3-D by one of the any amazing scanners and I watched a printer print out 3-D objects. The whole floor seemed to be buzzing about 3-D television and cinema, but that did not impress me as much. Over all though the whole floorshow was incredible. We stopped exploring to floorshow to see the keynote speaker, Will Wright. He was the most amazing public speaker I have ever had the pleasure of listening to. He was insightful, direct, entertaining, and highly informative. He was amazing. I cannot think of adequate words for his speech other than that. We also were able to see the making of Coraline. How they made the movie gave a whole new light and inspiration to the movie itself. To sum up my experiences I can say this about Siggraph; it opens up your mind and eyes to a whole new world of possibilities and achievements. I was amazed and enchanted throughout my whole experience and I cannot wait to see that the future holds. When I went to SIGGRAPH, I wasn’t exactly sure what to expect, as a sophomore in High School. I soon learned that the conference was absolutely massive, taking up three floors of the Convention center. After looking through the program, I realized that there was going to be something that interested everyone at the conference, and henceforth, worked out a loose schedule. SIGGRAPH was a learning experience for me, and I attended a few talks and courses. The one Keynote Speaker I want to point out was Will Wright. He’s the type of guy that can keep the attention of a large crowd by placing jokes throughout a 247 slide (approximately) speech. However, the information he gave was highly accurate, and gave me a completely different view of artwork and game design. His speech about perspective was very appealing to me, as an artist, as it taught me about how the placement of an animal, human or object can change how different people view it as a whole. I was also impressed by the Computer Animation Festival entries. Most of them were top quality work and had an interesting concept, taking creativity to a completely new level. The sheer amount of work put into everything I saw was overwhelming in its own right, and the programming for the animations must have taken a lot of trial and error. However, the thing that stood out the most to me was the Emerging Technologies section. Out of the many things I saw, one of the things I would applaud the most was the FUNbrella. Though its practical use is questionable, I think the way they transmitted vibrations was extremely intriguing and applicable in other places. The FUNbrella was a very creative invention, and worked really well. Another technology that impressed me was the Touch Pad Table. It allowed you to control anything electronic in your living room, as they rigged it up to a cleaning robot that could clean the carpet. They also connected it to the TV and Computerized Picture Frame, so you could simply drag and drop Movies/Pictures for you to watch. The table has insane practical uses if it could ever be implemented in an entire house, and can easily go very far. Lastly, I was impressed by the helmet that could control your movements. The helmet utilized clothespin-like objects that created a negligible pull on your ear. This pull would affect equilibrium, and henceforth throwing off your balance enough to where you would have to walk forwards, backwards, or to either side. It was a really cool invention that had a lot of thought behind it. All in all, SIGGRAPH was a very good experience for me, and I learned a great deal about how far technology has advanced in the world today. I believe that the only problem SIGGRAPH has is that there’s not enough time to do everything. SIGGRAPH truly is the greatest and most prestigious technology in the world today. SIGGRAPH 2009 made a very different impression upon my mind than I thought it would with the creative pieces of work, art, and electronics. I was very amazed by the caliber of new technologies each corporation showed me. I made sure to get a poster for SIGGRAPH 2010 and I wish to attend SIGGRAPH 2010. I also had my first Japanese candy there from the “Funbrella” group in Emerging Technologies. With the theory of virtual rain falling on to an umbrella and experiencing the actual vibrations of cats and dogs falling from the clouds or even buckets of water falling from up above, this is very constructive and worth a try. The Japanese candy was a definite plus. GigaPan was one of the great robotics groups that also was at SIGGRAPH2009. I made my first gigapixel panorama with their new machine, the GigaPan. A member of the GigaPan group showed a few members of our group the new technology of GigaPan. The new machine lets photographers have a more precise panoramic photo with more images in a variety of organized ways to create the panorama and I actually had the chance to upload my first gigapan onto the website. Being that I am a NOCCA | Riverfront student, we’ve been loaned the actual device from GigaPan that creates the wonderful panorama gigapixel photos. I’m looking forward to that in the future along with also helping and sharing with my fellow NOCCA students what I’ve learned and created. I really enjoyed Second Life’s presentation which was across the room from GigaPan. Though they had a lot of technical difficulties, I stuck around for a bit. I think that way that users and players would be able to purchase land and buildings. I was also surprised that artist used the program as a host of their artwork. Sadly I had to leave early. I was able to see never-before-seen clips of Cloudy With a Chance of Meatballs in 3-D. I must say that it is definitely a must see movie. The colors and vibrancy of the film along with the depth of field is beautiful. You should all go see it. I know I am. As an aspiring animator the SIGGRAPH 2009 conference was a wonderful affirmation in my choice in career. I had always had a profound love of animation ever since was a child but it wasn’t until I saw the numerous possibilities for an animator in the world at SIGGRAPH that I truly felt that I was putting my heart and soul in the right place. I’m so excited about my future as an animator I don’t know what field I want to work in the most. I can’t decide if I want to do special effects for films, make cartoons, or design video games. I couldn’t believe how many heavy-hitters in animation were simply walking around and mingling with people. I met on of the founders of Dreamworks Animation Studio and it was incredible how humble and sweet he was. I felt so lucky to be a part of it and I can’t wait to go again. The strides being taken in technology are so astounding that I don’t simply want to be a passive observer in its evolution. One of my favorite exhibits was the Emerging Technologies section on the third floor. The user interfaces of all the tech is just so fascinating and intuitive. Who would have thought you could make a 360 degree oscillating hologram of another person that changes perspective as you do? Or a coffee table that puts a person in full control of their living room? Or a helmet that controls people by tugging on their ears? Seriously that’s outstanding. I managed to get my friend to walk into a wall, it was incredible. It was really interesting to see the Will Wrights presentation on perception. As someone who never really paid much attention to the Sims franchise I really wasn’t expect that much when I went to his presentation. One of the things that I truly wasn’t expecting was one of the funniest, most insightful observations of the way humans perceive their surroundings I’ve ever witnessed. One of my favorite things about SIGGRAPH was the open studio. I used the dry-erase stop motion station to make a short morphing film. You can actually see my video if you go to http://www.youtube.com/watch?v=AahRtGR9yPE. Another feature of SIGGRAPH that showed infinite possibilities to me is the combination of three-dimensional scanners and resin printers. I found myself thinking that if the convention decided to set up camp permanently and become its own business right there in New Orleans, it could be one of the biggest entertainment industries in the world. I could get a USB drive at the Intel booth, bring it over to a 3d scanning station, scan my face, save it in Autocad, put the saved file in the flash drive, bring it to a 3d printer and print out my face. That. Is. So. Cool. One refreshing aspect of SIGGRAPH was the cultural diversity. I met so many interesting people from all around the world. It makes me want to travel the world and learn more about technology in France, Japan, and others. The digital animation festival was thoroughly inspiring and impressive. French Roast is probably one of my favorite short films of all times. It took me a few watches to notice that the whole short is facing one direction with the use of a mirror to show the full scene. It was beautifully orchestrated, well developed, and funny as hell. I’m very happy that it won the Best In Show award. I can’t thank Terry and NOCCA|Riverfront enough for giving me the opportunity to attend SIGGRAPH. Its one of the single most satisfying experiences of my life so far. I felt blessed to get a full convention pass and my only regret is that it wasn’t two weeks long so I could have done even more. My mind is literally spinning with excitement and drive that I wouldn’t have had had I not attended the conference. The leaps and bounds in digital animation and computer graphics software alone were enough to make me run around the showroom floor like a kid in a candy store. I’m so astounded by the technology and possibilities the future holds that the future is looking brighter than ever. I was very much amazed with Siggraph. It was my first time attending, so I guess it would be amazing to me no matter what. I went to many talks, courses, papers, The Exhibition, The Job Fair, The Studio, The Sandbox, & Emerging Technologies. I found some things very fun & entertaining, & some things boring. Some of the talks, papers, & courses I attended, I found to be rather boring. I fell asleep during most of them. There were a couple I did find interesting, such as The Art History of Games, & Playing With Perception with guest speaker Will Wright. Otherwise, most of the other talks, papers, etc… I attended just couldn’t grasp my attention. On Tuesday, Wednesday, & Thursday, I found myself wanting to go to the Exhibition, Emerging Technologies, The Sandbox, & The Studio more, than wanting to attend any talks, papers, panels, & courses. I thoroughly enjoyed The Exhibition & The Job Fair. The Exhibition had so many things to see & do, I didn’t know where to begin & where to end. I discovered all kinds of new software & hardware, & I even got to try some of them out! I think that also having art colleges & institutes there also made the Exhibition worthwhile. I got to learn about a few colleges I’m hoping to attend. So in my opinion, not only was the Exhibition fun, it was educational, & beneficial to me in many ways. The Job Fair was great too. I got to learn about some graphic companies, & even learned about intern opportunities. The Job Fair was beneficial as well. The Studio, The Sandbox, & Emerging technologies were very entertaining to me. Hands on technology grasped my attention & kept me entertained. I can’t say specifically what I found amazing because all of it was amazing; there’s not one thing in particular I didn’t like. In conclusion, Siggraph2009 was great. It had its pros & its cons, but the overall experience at Siggraph was magical, mind blowing, & beneficial. I had an enjoyable time. If I ever get the chance again, I would love to return to Siggraph. I’ll cut to the chase, SIGGRAPH was probably the most fun and interesting experience I’ve ever had in my own city. I can’t thank the people who made my attendance possible enough. I had a really amazing time. SIGGRAPH was the kind of experience that I had only dreamed existed, much less be able to attend. So when I heard from Mr. Terry that they were letting a few students from NOCCA go, I more or less begged him to let me attend. SIGGRAPH sounded perfect for me. My dream job is to work on designing video games as a career; I have also considered working as an animator too. Pretty much any job that involves the combination of art and computers interests me. So when I was chosen to go to SIGGRAPH I knew that if I could only go to one conference in my life this would be the one. When I arrived on Monday morning I was surprised by how many people were there. I had expected a crowd, but not thousands of people. I immediately noticed a variety of languages being spoken. It had never really occurred to me before that animation and computers was such a worldwide phenomenon. I was also surprised that most of the people there were actually in the industry, networking and communicating. I had thought that it was going to be mostly a bunch of interested tourists such as myself wondering around, gawking at things in awe. Believe me; I did a lot of gawking. My first impression of SIGGRAPH was that it was a just a big family, a place where people with the same interests got together to help each other out and to show each other new ways to solve industry wide problems. My first day was mostly spent wandering around and getting a feel of the Convention Center. Even though I’ve lived in New Orleans my entire life I had actually never been inside. I went to the 3rd floor to see Emerging Technologies and had my mind ripped apart. I can’t wait for many of those products to come out on the market. Especially the fabric with invisible ink, just think of all the cool fashion ideas that can be accomplished with that. While I was up there I ran into someone I really admire, Johnny Lee. He revolutionized what could be done with the Wii-mote and it’s capabilities in motion tracking. He was very nice and we talked for a short while. It was really amazing how such prominent people in the industry were just nonchalantly walking around the building readily available to talk to. I also went down to FJORG on Monday to see how the animation teams were doing. (I wouldn’t mind doing that myself sometime in the near future.) While I was walking through a team member yelled at me to stop where I was. I was worried at first, but then I realized she was just sketching me, or actually my pants. She told me her animation was going to have an artistic theme based around a plaid pattern, and I was the only person she had seen all that day that had plaid on. I went to FJORG throughout Monday and Tuesday to check how her team (Team Sparkle Kittens) was doing. During the awards ceremony her team won best art style, and I would like to think it’s thanks to my pants. The remainder of the day was spent not getting lost and just getting used to the building. I was very excited for Tuesday, because that was the day that one of my idols, Will Wright, creator of the Sims, was speaking. I found his talk on how we perceive things very interesting and it gave me a lot to think about in terms of what work a game designer has to do and how they have to think. Tuesday was also they day that the main floor opened. I spent more or less the rest of the day in there. I was happy to see many of my favorite companies there such as, PIXAR, DreamWorks, Anime Studio, Google, and Autodesk. I went to these companies first but I eventually found myself looking at companies that I had no idea existed. I also found myself looking at colleges. Before SIGGRAPH I had though that they’re were only 2 good colleges with good game design/animation courses, but now I have about seven colleges to choose from. I also signed up for a tutorial on Tuesday on how to use Anime Studio 6, I had bought the software a week before SIGGRAPH, fooled around in it a week before and left it alone, now after the tutorial I can’t get off of it. I was sad when I had to leave on Tuesday, but all the freebies in my book bag were weighing me down. On Wednesday, I discovered the studio. When I walked in there was not a single computer available except for the clay-mation booth. At first I fiddled around with the clay thinking it would be something to keep me occupied for half an hour, but that half an hour turned into a 2 day project. You can see the result here http://www.youtube.com/watch?v=anNDR_gAdBs. I also helped a fellow NOCCA student with his dry erase animation right next to me http://www.youtube.com/watch?v=AahRtGR9yPE. I used my clay-mation in an art project at school last week. Wednesday night, I went to the animation festival, there were some really interesting clips and some really creepy ones. But all in all, I enjoyed watching the best animation of the year, the festival gave me something to aspire to. On Thursday my teacher had scheduled a camera workshop with GigaPan for NOCCA students. I was the only student that showed up. We were taught how to use them and went outside to test them; this is the result of that ( http://gigapan.org/viewGigapan.php?id=29880). GigaPan donated two cameras to NOCCA and I actually rented one this weekend and went out yesterday to take pictures with it. The rest of Thursday was spent either on the main floor or going to various talks. One of the talks I found the most interesting was by the director of the short animated PIXAR film, Partly Cloudy. He gave us an inside look at PIXAR’s storyboard techniques and how ideas are chosen to be in films. It was a very interesting talk and I am considering working for PIXAR now too. On Friday, everything was pretty much closing down so I spent my time in the bookstore waiting for the special showing of Cloudy with a Chance of Meatballs. I bought two really good books at the store. They are sitting on my desk now half way read. SIGGRAPH was a great place to find books; they had so many interesting ones, if only I had brought more money. Cloudy with a Chance of Meatballs looks like it’s going to be a great movie; it was shown in 3D and looked beautiful. So if you see it, make sure you see it in 3D. After the movie the conference was more or less over, so I headed out. SIGGRAPH was an amazing experience and I would like to thank you and everyone else that made my attendance possible. It was an eye opening experience, and now I’m more excited than ever about possibly working in such a great, friendly industry after college. I had a lot of fun and saw many interesting technologies and people. I had such a good time; I might even be back wearing a red vest next year. The first thing that hits you when you arrive at the SIGGRAPH convention is how much there is to do. There are talks, course, presentations, an animation festival, and a showing of cool new technology and that is not even counting the massive exhibition that they have. There is pretty much something for everybodys different technological tastes. Also, even though it was very big, everyone was very nice and if you had any questions they were glad to answer them. One of my main interests is film making and animation, so for the most part I sat in on the programs based around those concepts, but for the first day I was there, I went to go check out the new technology that was being developed. What I saw was very impressive and weird at the same time. One of the weirder inventions was an umbrella that could simulate the feel of rain, and, uh, spaghetti falling on the top. Im not sure what practical use it has, but I enjoyed it never the less. One of the really cool inventions that will probably not see the light of day for at least six or seven year as I was told, was an augmented reality game, which is similar to virtual reality, except that it was a game that you played virtually using actual, physical, game pieces. Its really hard to describe but really awesome. Starting on the second day, I would go to whatever interested me, and like I said, there is a lot there, and pretty much all of its interesting, so you have to stick with what you are really interested in, but it doesnt hurt to see things you normally wouldnt look at. So for the most part, I sat in on a lot of the animation and film making talks and sessions. I got to see how they made the CG and effects for the blockbuster films Terminator: Salvation, Transformers, and Star Trek, and each one blew me away with how much work they put into it, and how excellent they were in terms of technical design. I also got to see how an upcoming film, Cloudy with a Chance of Meatballs, was made. I had never really seen how animated movies were designed before, and the work they did was really good. I saw how the movie I made, from the beginning to end. They walked through how the idea first came up, then how they decided on an art design, then the story boarding, all leading up to the technical designing, and I even got to see some clips from the movie. Again, just the amount of work that goes into these production is amazing, as is the dedication you have to have to make them. They also had an animation festival, which was very interesting, many of the videos they had showed off some incredible technology and creativity. My favorites were from the 2 Cool 4 School presentations, which included Chroma Chameleon, where I got to see some really nice camouflage effects and a funny storyline as well, but there were a few, specific ones, that were really just commercials. One of the most enjoyable talks I sat in on was called Building Story in Games: No Cut Scenes Required, which was about the budding new efforts to place more immersive story telling in games. What was really interesting, however, was being able to listen to these guys talk afterwards, and being able to really get some insight into the interesting. I also managed to come away with some good writing tips that not only apply to video games but to film making as well. My whole experience was both educating and fun. I managed to learn a few things about subjects I enjoy, and get some insider information about what goes on behind my favorite studios, while also getting some practical knowledge that I can use to help my own film making and animation interests. I’m not sure how to start out this essay, except to say that SIGGRAPH was a great experience. Right upon entering the New Orleans Convention Center, I was immediately impressed by the scale of this conference. I had never been to the convention center to begin with, so I was expecting some kind of small building with a couple of little rooms. Instead, there were of course numerous huge rooms filled with all things siggraph. My first and probably my fondest memory of siggraph would probably have to be Quazi the robot. Though I knew it wasn’t a real robot, I simply couldn’t pass by him without stopping and watching for a few minutes. For some reason, almost everything that little robot said made me laugh. Whether people asked him if he knew about FJORG or whether he had seen Star Wars, he always had a humorous response. Not to mention, seeing people’s responses to Quazi’s questions were often just as funny. I wish they had something like him in the French Quarter. Another lively aspect of Siggraph that Quazi mentioned occasionally was FJORG. I enjoyed seeing the FJORG Vikings roaming around the convention shouting, “FJORG!” and whatnot. Although, I have to say, I was a bit disappointed by the winning FJORG animation that was shown. But then again I guess you can’t expect too much out of an animation made in 36 hours. The next best thing about Siggraph was probably Will Wright’s keynote presentation. He talked about a variety of things, from how different forms of media affect each other, to how popular his cat was on KittenWars.com. I liked his advice on creating video games that instill creativity within the game-playing community, such as in Spore. Because people are able to create such a huge variety of monsters, the game swelled in popularity much faster than they had anticipated. It was this and other bits of information and humor that made Wright’s speech easily the best I saw at Siggraph. The other keynote speeches were good, but not as good as Wright’s. Randy Thom’s talk on sound production for movies was interesting, but I didn’t like having to sit through the hour or so of awards ceremony before he came out. It was like a big, “Ha ha!” to anyone who didn’t look closely enough at the schedule. I guess, though, if they had the awards ceremony take place as its’ own separate event, then they wouldn’t have gotten half the audience that they did. Anyways, Randy’s speech was more or less worth the wait. It’s amazing how much work goes into the sound production of some movies, like Apocalypse Now and Wall-E, which Randy was involved with. When I start a new film or animation, I hardly ever think of sound as a major factor. Even when I’m watching a movie, I don’t always pay attention to all of what I’m hearing. After hearing Randy talk for a little while, and then watching a long clip from Wall-E again, I was amazed at what I heard. He was right, in that Wall-E is completely the opposite of a silent movie. There are sounds everywhere; it’s just that if it’s not dialogue people don’t pay attention to them. In the future I’m going to try and put a lot more pre-production thought into sound. Finally there was the last keynote speaker on Wednesday, Steve Duenes, who talked about the New York Times. It was an interesting look into the interactive maps and charts that his newspaper creates. The subject matter of newspaper charts seemed a bit out of place at Siggraph, but I liked it nonetheless. One part of Siggraph that I guess I could say I was a bit disappointed in was the Sand Box and interactive area. While some of the creations were interesting, most of them lacked any practical functionality. Sure, a paper shredder with eyeballs and a sense of touch is quirky, but nonetheless pointless. Then there was the squishy baby doll that cries or giggles at various touches. There were the blocks that change colors when you move them on a grid. All of this was mildly amusing, but I couldn’t honestly tell the creators, “Good job.” At such a high tech convention, I was expecting much more out of these never-before-seen inventions. Instead, a lot of what I saw seemed like something made for a high school science fair. Now, don’t get me wrong, there were some things that impressed me. The living room coffee table that controlled the digital picture frames, T.V, and lights in its’ surrounding area seemed to be something from the nearby future. The virtual reality headgear and green screen room seemed like the beginnings of a new type of video gaming. In the future, I would rather see technical geniuses spending their time on such practical things, rather than a lot of the other things saw at siggraph. One aspect of Siggraph that I didn’t really love or hate was the bottom floor booth area. I spent my fair share of time wandering around the booths; looking at all they had to offer. A large portion of them, though, seemingly had nothing to offer. A lot of the company booths simply had TV’s set up displaying their work and a nearby stack of brochures. To me this was no better than the random popup advertisements you get on the Internet that you usually immediately close, (or in this case, walk past). The better of the booths were the ones that had demonstrations. One man was digitally scanning into Maya a sculpture of a lion using some new device the company was selling. Other more flashy booths like the MoCap one had a man constantly dancing on stage demonstrating their product. Had I been a rich technology man looking to invest in something, I probably would’ve been more attracted to the demonstration booths. While wandering the booths, I also almost won a $1,000 animation program. The ‘Art Wars’ people gave it out to the first person to raise their hand and shout something about Art Wars. Sadly by the time I realized, “Whoa, this is a free $1,000 program. You should raise your hand,” one other guy had already raised his. Despite not getting it, it still made that booth much more interesting and I came back later to see if I could win anything else. Free stuff is always great, and there was a decent amount of it at Siggraph. Besides all of that, the rest of what I enjoyed was the various other presentations I went to. Chris Landreth gave a great presentation on his technique of ‘Psychorealism’, in which he depicts mental aspects of characters in their physical attributes. According to him, once you reach a certain point in CGI realism, you either have to distort your characters or they will become too freakishly real. He also showed his latest animation, ‘The Spine’, which I hate to say I was disappointed in. Another film I got to see at Siggraph, which I was the opposite of disappointed in, was ‘Coraline’. It was a great movie with almost seamless stop motion animation. The earlier demonstration on the 3-d printing machines they used was really interesting too. Apparently this whole 3-d printing thing is a big deal, because everyone went crazy when they were allowed to take pictures of the 3-d printed models of Coraline and other characters. I also got to see a great presentation on the animation of Terminator, Transformers, and Star Trek. They showed in depth images of what the special effects and animation looked like at all stages of production. For one scene, they created 3-d images of Arnold Schwarzenegger’s head from scratch and pasted them onto another man’s body, (sadly, Arnold’s real life head wasn’t available to scan). I also later went to a similar presentation on the production of watchmen. It was interesting to see how regular hand drawn animation is still used in the 3-d world. To create the swirling inkblot patterns on the ‘Rorschach’ character’s mask, they hired traditional animators to first create original drawings. Then they digitized them and applied the patterns to the mask. Besides those, there were various other presentations I went to that were pretty good. There were a few, however, that were a bit over my head. I made the mistake of going to one of the ‘Technical Papers’ presentations, where basically everything they said seemed like another language. Another presentation that I was attracted to by the schedule title of ‘Benjamin Button’ ended up being about digital lights and stuff that I almost fell asleep listening to. At another presentation on ‘estimating specular roughness from Polarized Second-order Gradient Illumination’, I actually did fall asleep. Anyways, that about sums up most of my experiences at SIGGRAPH 2009. It was great having the convenience of such an international festival at my home city, and being able to go completely free. I’ll probably consider volunteering or somehow going to Siggraph again the next time it comes to New Orleans. I want to thank you so much to everyone who helped make it possible for me and the other students to go. It was definitely a worthwhile experience.